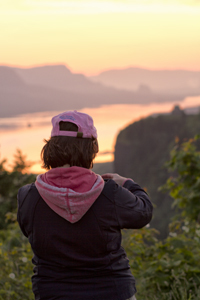 The Columbia River is the 4th largest river in the United States, and cuts its way from the Canadian Rockies through Washington and onto the border of Oregon, where it has cut through the volcanic rock leaving behind a giant gorge. The walls of this gorge plummet from the mountain highlands down through vibrant green rain forests, before meeting up with the river. 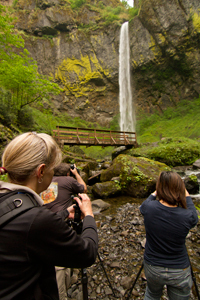 The constant rains of the Pacific Northwest, along with spring snow melt from the higher mountain regions, give way to some of the world's highest concentration of tall waterfalls. 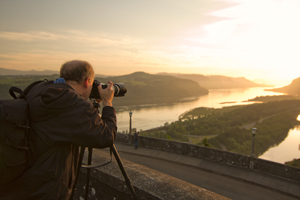 Hundreds of people a day flock to the Columbia River Gorge to see these waterfalls and explore the lush canyons in search of adventure, and of course great photographs. 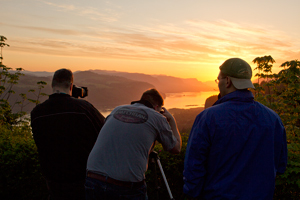 A group of thirteen eager photographers met professional photographer and instructors Brian Rueb and Scott Donschikowski just outside of Portland for a weekend of fun, adventure, and photography in Oregon's lush Columbia River Gorge. The weekend began with an orientation in the hotel to go over the schedule, safety, and what to expect for the weekend. For some, this was their first time with the Aperture Academy, and for others it was a reunion of sorts. We had over six people on this workshop who were members of our Hall of Fame! In addition to the discussion of the weekend's photography, one of the prime questions asked during orientation was, "What time do we have to meet in the morning?" The answer was 4:30 am. At 4:30 am on the first day of shooting, the class met in the parking lot and loaded up into the ApCab, sleepy but ready for a full and fun day of shooting. 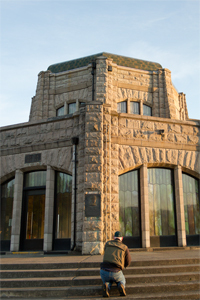 The first vantage points centered on The Crown Point area of the gorge. Even as we pulled out of the parking lot, we could see a faint glow in the cloud-filled sky, letting us know we had potential for a really nice sunrise to start our morning. The view from the Women's Forum overlook is spectacular. 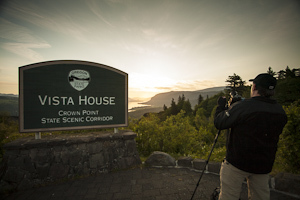 Not only can you see the vastness of the Columbia River spreading through the gorge, but you also get a nice shot of the Vista House at Crown Point. 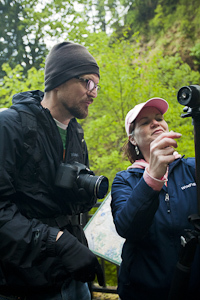 Scott and Brian worked with the class on finding the right lens to get the telephoto compression that allowed them to get the Vista House in their images as well as the many layers of the different fingers of the gorge that jutted out into the river. The sky did not disappoint either! Golden hues, pinks, oranges and some purple all at once. 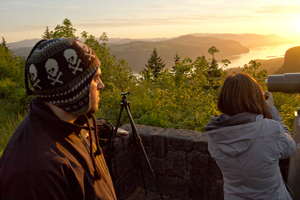 The class used polarizers and graduated ND (neutral density) filters to help achieve nicely balanced scenes and get really nice vibrant sunrise images. 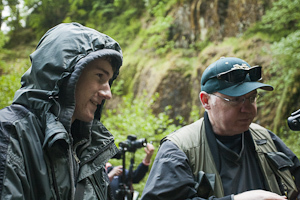 Brian and Scott were close at hand to help clarify camera settings, critique compositions and answer questions on filter use. 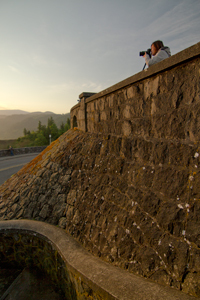 Once we had finished the Women's Forum overlook, we went to the Vista House to shoot that vantage point and get some images of this iconic beacon of the Columbia River Gorge. The class was really great at making the most of an area and spreading out, each looking for his/her own unique take on the stone structure, or the vantage point of the river and gorge below. It was a tremendous start to the morning! 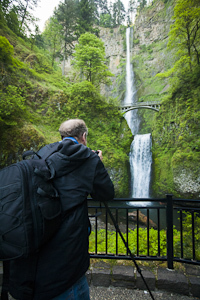 However, the weekend was about waterfalls, so what better way to get started than the iconic Multnomah Falls, the most popular waterfall in the gorge? This magnificent icon is split into two tiers with a lovely stone bridge spanning a section across the middle of the tiers. 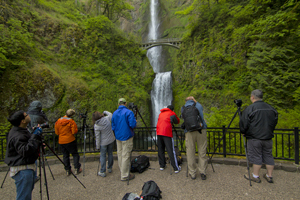 The group was in awe as they craned their necks trying to take in all 611 feet of this monster waterfall. 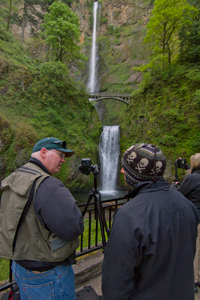 Brian and Scott helped the class with polarizer use, and getting different compositions that really brought out the best of the falls, while not necessarily requiring one to shoot the ENTIRE waterfall. The lower portion of the falls offered numerous compositions and chances to create memorable postcard-like images of this watery giant. From the bottom of the falls, it's only a short distance to the bridge where more photographic options present themselves for photographing the top tier of the falls, and the lush green rocky pool that sits at the base. 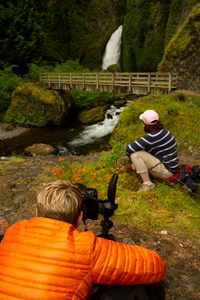 The class took a variety of shots that accentuated the color and textures of this portion of the falls. It's quite the spot! 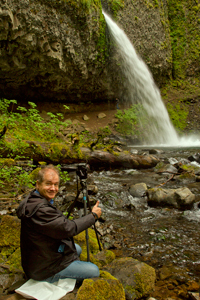 The next location on our waterfall adventure was the wonderful Wahkeena Falls. This little beauty has a couple different options for photographing. 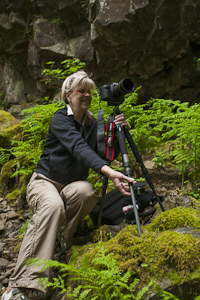 The first is photographing the creek and the mossy rocks that dot the twisting waterway as it winds off from the falls. 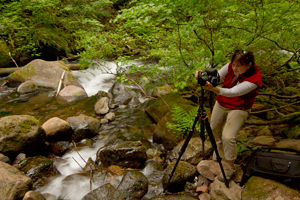 The second option is photographing the falls itself, which was a misty challenge that everyone handled really well. 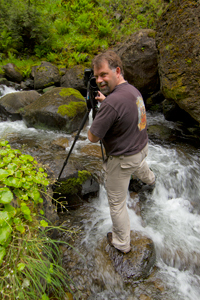 Scott and Brian helped with compositions and offered suggestions on increasing ISO to help speed up shutter speed in order to A) minimize time water could accumulate on the lens, and B) provide more detail in the waterfall. Waterfalls flow at very different speeds and are always different sizes, which makes them almost like math problems that need to be solved. Each waterfall has an exposure length that lends itself best to the type of movement and power unique to that waterfall at that time of year. These are just some of the types of tips and information provided by our instructors. 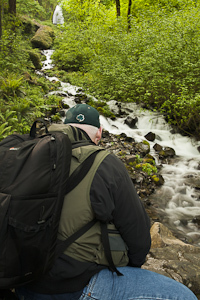 Once everyone had their fill of Wahkeena Falls and wiped enough mist off of their lenses for a lifetime, it was time to head back to the hotel for an afternoon break before setting out for our afternoon waterfalls. After an hour impromptu Photoshop lesson from the instructors, it was off again in the ApCab. 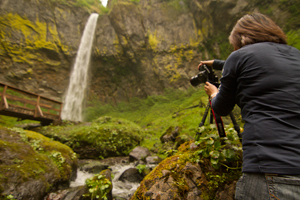 The first stop was Bridal Veil Falls, a scenic little beauty tucked away below the historic highway 30. This is the ONLY water fall in the gorge that flows below the highway, which while interesting, does nothing to affect the way the falls are photographed. This waterfall, in addition to the very picturesque creek surrounding the falls, also has a couple different vantage points to shoot from. Whether it was from the manmade viewing platform, atop one of the large rocks adjacent to the pool at the falls base, or right along the pool itself, the class really spread out and came away with a lot of nice compositions, and showcased this little gem beautifully! We like to end the first day with a bang, and a hike! The final spot for the evening was the uphill stroll to the wonderful Ponytail Falls. 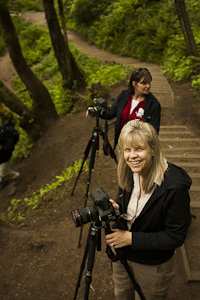 The trail winds through a gorgeous green canopy of trees, mossy rock walls, ferns and flowers...it's a beautiful experience that leads you to a bowl-shaped amphitheater lined with basalt and other ancient volcanic moss-covered rock. Ponytail Falls shoots out from a narrow gouge in the rock. A trail has been cut behind the falls so travelers can feel the mist on their face as they wander the trail looking for a perspective to shoot. Our class again made the most of this roaring beauty and spread out high and low looking for just the right angle. A few adventurous souls even braved the icy water to get up close and personal with the scene. Brian and Scott worked with the class on composition critique and settings. 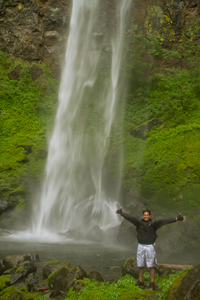 Something that waterfalls have, which proves difficult at times, is moving foliage. 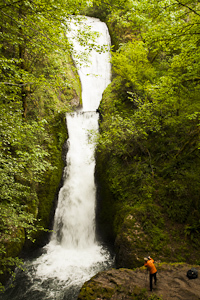 The waterfalls generate wind, which blows trees, ferns and flowers all over the composition. This can look quite distracting in a larger print. To combat this, Brian showed some students how to take two exposures. One exposure at a high ISO, to get a faster shutter speed to capture the foliage still and sharp, and another slower shutter speed at the traditional 100 or 200 ISO to get that nice silky water image of the falls and creek. He explained how the two images can be blended in post-processing to create one outstanding image with a wide depth of field, and great sharpness throughout. 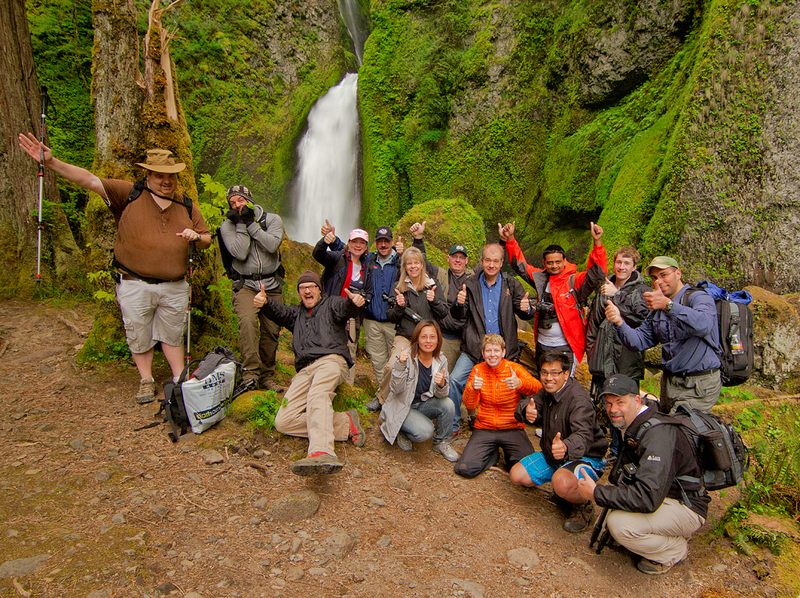 The class loved the last falls, and it was the perfect cap to a great first day of shooting. Everyone enjoyed dinner that night, and a much earned good night's sleep. To help ease the pain of the first day's early start, the instructors kindly gave everyone a start time of 5:30am for day two. 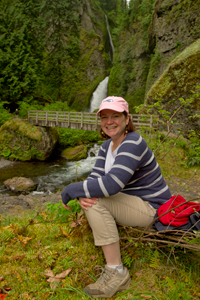 The second day began with another bang, and another hike...this one was the moderate hike to roaring Wahclella Falls. This huge waterfall sits tucked away deep into the gorge. It was lush, vibrant, and bursting with that spring green color. 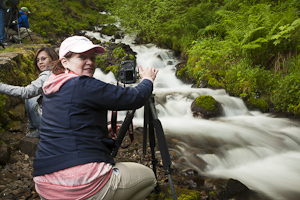 The class loved this spot because it offers so many different options for compositions. Because the class was quite knowledgeable on the basic camera settings on manual, the instructors spent a lot of time pointing out compositions and helping the students maximize the settings to fit the vision they had for each image. 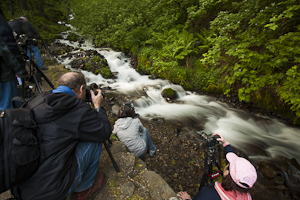 Those visions led some students to shoot while in the water, up closer to the falls, using moss-covered rocks and the moving stream to create a dynamic image. 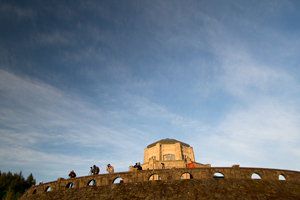 Another set of students climbed high on a ridge to shoot the grand scene as a whole. Others climbed on to some rocks to use a batch of Indian Paint Brush flowers as a foreground, and worked on shooting for different depths of field and movement using ISO as a primary tool, and then getting telephoto compression to give the foreground a larger more prominent role in the images. There was SO much to shoot! The class spent over an hour at this dandy little falls before finally moving on back towards the car along the beautiful Eagle Creek. The second stop was one not as commonly visited by tourists, but well known by our instructors. 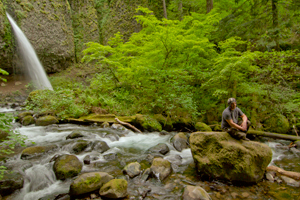 Ruckel Creek has some of the best rainforest foliage and green mossy rocks in the gorge. The creek absolutely explodes with color and texture. The class spent over an hour here, carefully walking the creek side, looking for interesting shots that showed off the color of the valley and movement of the water as it made its way down to another waterfall on the morning agenda, Lower Ruckel Creek Falls. Lower Ruckel Creek Falls was very easy to get to, which was much appreciated by the students who were plenty happy to not be walking uphill! Most of the class was happy to cross the creek here to get different vantage points of the waterfall from the left, right, and even from smack dab in the middle. 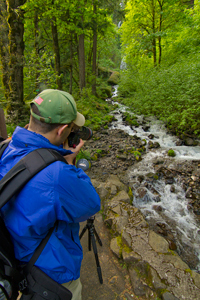 Brian and Scott were on hand, and not afraid to get wet to help the students stop foliage movement, work on using logs and curves for leading lines in the compositions, and just help hold gear as students moved around the slippery creek. With Ruckel Creek under our belts, the class had completed its second morning of shooting, which included hiking over three miles! Everyone was ready for another much earned afternoon rest. 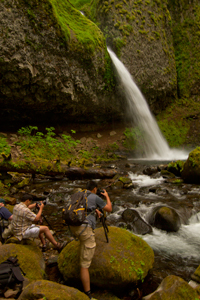 With the other locations "in the can," it was time for the final waterfall of the weekend, the elegant Elowah Falls. 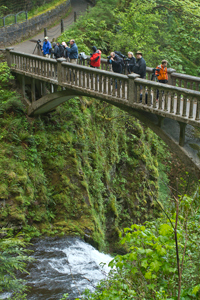 For many, this is one of the jewels in the gorge. This 200 ft. ribbon fall drops perfectly in to a small pool lined with lush mossy boulders. 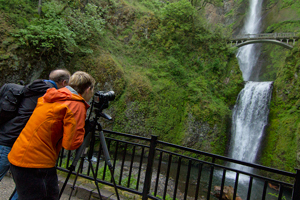 As is typical with many of the falls in the gorge, there were many options for different compositions from numerous vantage points. Students shot from both sides of the scenic little bridge that crosses the creek, from far down the creek in the water in behind the bridge, from farther down the creek in the water, up high on a giant rock to the left of the falls looking down, and even down by the pool in front of the bridge. As one student put it, "I could've spent all day just here." Another said it was one of the best waterfalls they'd ever seen. Both instructors worked hard with the class to make sure everyone got some nice images of this great waterfall that they could be proud of. 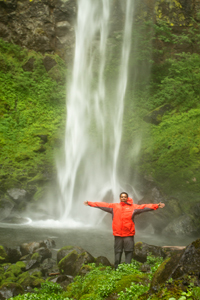 It's a perfect waterfall to end a weekend of perfect weather, and perfect fun, deep in the Columbia River Gorge!